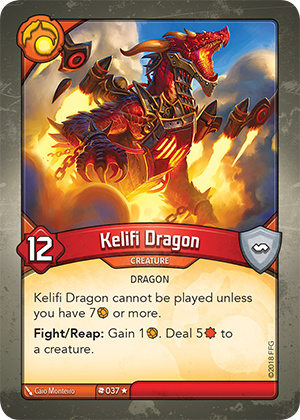 Card Text Kelifi Dragon cannot be played unless you have 7 or more. What happens if I play Kelifi Dragon via Wild Wormhole (“Play the top card of your deck”) and I have less than 7 Æmber? If you have less than 7 Æmber, Kelifi Dragon cannot be played, so it returns to the top of your deck.